When someone insists they ‘love’ what they do for a living, there’s always that gleeful smile to support such a claim. Conjuror craftsman David Ben need not utter a single word about his professional passion—it’s as easy to see as a Queen of Hearts rising from its deck right in front of you. Hocus Pocus, his carefully concocted salon event, is up to the usual shenanigans without relying on wires or mechanical gadgets in securing illusion ecstasy. 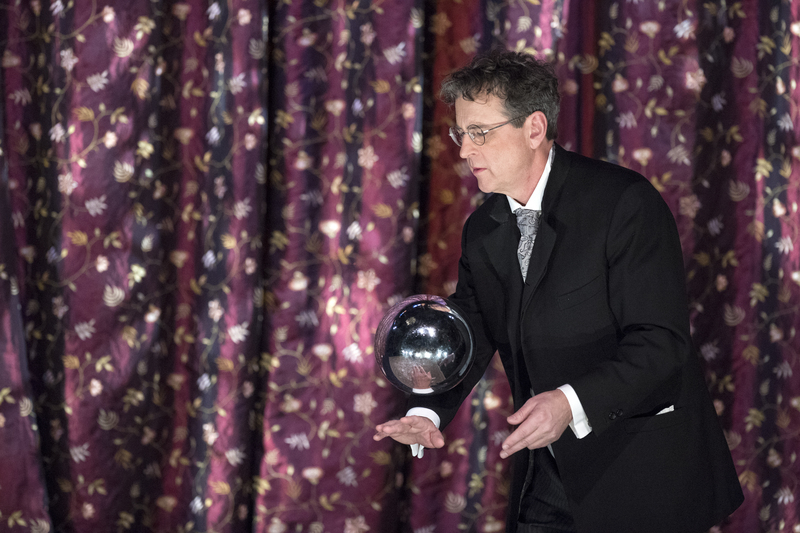 With minimal apparatus at his disposal, he instead takes audiences for a walk down memory lane in a holiday salute to the great magicmakers that came before him including T. Nelson Downs and the great Harry Houdini. Stylized sleight of hand just doesn’t get any classier than this! Eyes widen with his array of card tricks, jaws drop when sheets of metal separate a woman’s body, and hearts skip a beat when tied thumbs move directly through a Samurai sword without a single thread being compromised. He springs all of the mind’s trap doors to keep you guessing how it’s done. And talking about freaky, one exercise in particular has several spectators drawing figures on a piece of paper with a mysterious spirit helping single out who is responsible for what can only be deemed as future relics destined for the ROM. Perhaps the undisputed showstopper comes with the consumption of 20 needles and 4 feet of thread before the crafty artist produces a final product that defies oral capabilities. You don’t get away with producing thaumaturgical maneuvers for this long without leaving a lasting impression. David Ben is the real deal and there’s no second guessing this nimble enchanter.